Bald Mountain Pond, with the Appalachian Trail on the right. 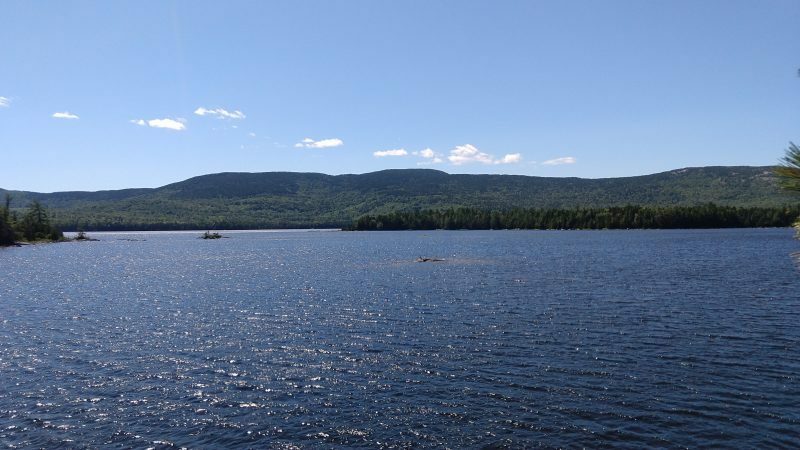 The Maine Appalachian Trail Land Trust is working with The Trust for Public Land on completion of the Bald Mountain Pond project on the Appalachian Trail east of Caratunk and The Forks. Bald Mountain Pond is a 1200-acre, undeveloped body of water located just south of the A.T. where it descends Moxie Bald Mountain. Conservation of the ridge and the pond together comprise a Phase I and a Phase II of this project. The area supports a variety of regionally and nationally significant wildlife such as the landlocked Arctic char and Canada lynx, a federally threatened species under the Endangered Species Act. Conservation of this property will also secure an important buffer for five miles of the A.T. and new public access to Bald Mountain Pond via 19 miles of private logging roads for hikers, paddlers, and anglers. Together, these mountain and water features make the property an iconic destination for backcountry adventures that combine paddling and hiking on the A.T.
Bald Mountain Pond is the consensus highest ranking conservation priority on the entire A.T. in Maine, and is one of the most special locations on the trail. It is rare to find a pond this close to populations centers to the south (approximately 2.5 hours) that does not have a single visible structure along the entire shoreline. On most weekdays you might be the only person on the pond. Combining a paddle from the boat launch with a hike up Moxie Bald can be done as a day trip and it’s one of the best in Maine. This project will be completed late in 2018 and will protect some 2,600 acres along the A.T.